Your parents or grandparents probably told you that you shouldn’t watch TV with the lights out. And for taking care of your eyes, that can actually be sound advice. Failing to develop a soft contrast between your screen and the environment around it, your eyes probably aren’t going to suffer a bunch of permanent damage. But they will be strained. It might even contribute to headaches or eye dryness. How much light do you need to fight-off those bad effects, and without totally ruining the atmosphere by turning on too many lights? As it turns out, not that many lights at all. And headaches aside, there are all kinds of extra benefits to a little ambient lighting. Done correctly, it can look very cool. From a strictly utilitarian standpoint, it can help you see better behind your TV, which can make it a bit easier to plug or unplug stuff. Which is precisely why a lot of high-end TVs these days are being made with built-in lights. But getting the right lights depends a lot on understanding your own individual circumstances. Different environments, different sized TVs, and people with different aesthetic goals will need lights with a different range of capabilities. The simplest thing you have to worry about is the number of lights you need to fill the backside of your screen. Smaller light kits tend to run around 5ft in length. That’s adequate for a smaller TV, or even a larger computer monitor. But for someone who’s trying to adapt a super-giant 76” LED television, you’re going to need LED strips that are sized to match. Lights need to get power somehow. In a lot of cases, LED backlights are made so you have to run a separate power adapter for the lights. That’s not too bad, since LEDs don’t draw that much power, and you’re running the adapter in a place where you might already have another AC wall socket to use. But some LED bias lighting can be powered through USB. In most cases, that’s actually much simpler for people who have an idle USB port on their display. But the relative rarity of these USB designs also means they tend to be slightly less modular, and slightly less adaptable on the whole. If you’re trying to set some kind of special ambiance, it can be useful to have different color options at your disposal. Some LED bias TV backlighting is made to only provide a small range of colors, sometimes as few as 10. Others provide an unlimited range. But as you’d probably expect, having multi-colored LED is typically a bit more expensive than those with more finite operation. So going with simple white LEDs can often save you a few bucks. But there’s palpable differences between different shades of white. Daylight color temperatures around 6000K or 6500K can be especially good for providing high contrast images, even if those temperatures mean extra exposure to blue light. Slightly warmer whites like 5000K are often described in marketing materials as being daylight white, but for people who are looking for particularly bright lights, the difference does matter. Occasionally you need more than just 15 color options. Sometimes you really do want to find that perfect shade of blue. If that describes you, then you might like the Govee LED Strip Lights. They’re built around the idea that backlighting should be fully adjustable. In fact, you can pretty much take advantage of the full range of possibilities for LEDs, moving between 16 million colors of your choosing. Govee LED Stripe Lights are made to run 6.5ft, which is a good length for people trying to take on smaller installation tasks. Decent for running along 40” televisions, but you wouldn’t want to stretch them much further than that. A 50” screen would be passable, and a 30” screen would be workable, but the closer you are to 40”, the better. Interestingly, these strips were built to be powered by USB. 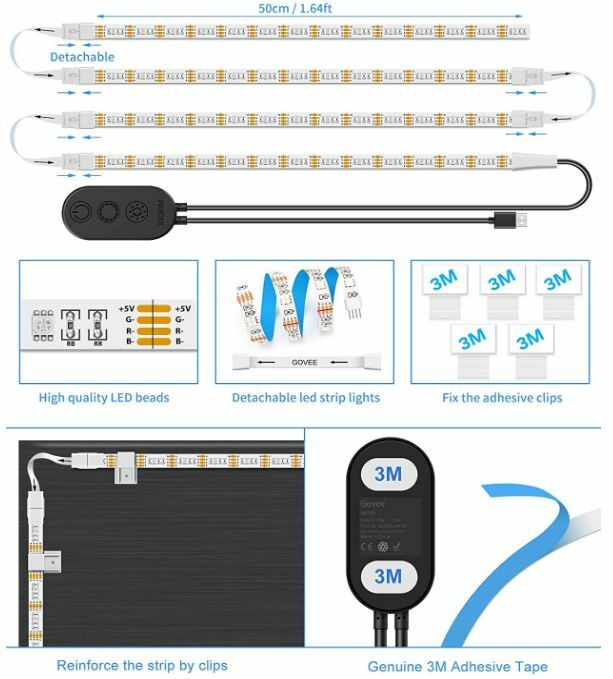 That makes them some of the most user-friendly easy-installation LED strips out there. At least, assuming you’ve got a display with a USB port that’s ready to power things for you. If you don’t have an available USB port, this arrangement could be a bit of a hassle to work around. Though not impossible to fix. Similar to the previous lights on this list, the lightweight nature of this kit ensures it’s easy to install everything with basically any strong adhesive. The lighting tape includes five buckles you can use to help stick the cable into place, but if you were interested in a totally secure installation, you unfortunately have to bring some of your own solutions to the table. 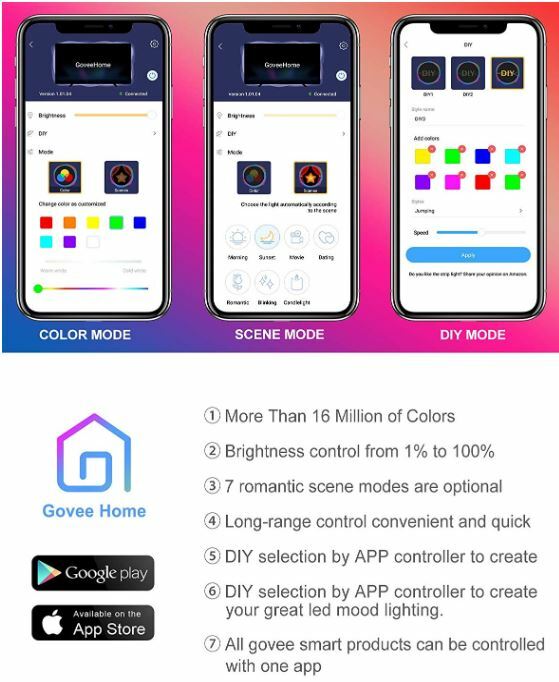 Another distinguishing feature of Govee LED Strip Lights is that you can operate them through an included app. That includes color selection, and picking through a variety of preset color transition options. If you’re looking to be hands-on with your color selection, you can do some pretty intricate things. If you’re looking to be a little more hands-off with the lights, there are a number of presets you can use, seven in total, that help animate the lights into cool ambiance. The app has support for both iOS and Android platforms, so you don’t have to worry about encountering issues with compatibility. Like almost any pair of similar lights, it may be worth pointing out that these lights are not waterproof. Considering that your television probably isn’t waterproof, that’s not bound to be much of an issue. Similarly, they emit a very low level of heat, largely the result of a modest 5V operation. That allows them to remain touchable, even after long periods of operation. Consequently, they’re probably safe to have around kids. 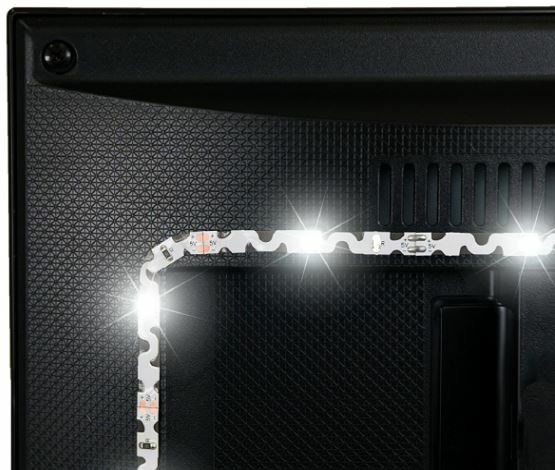 Govee includes a 12-month warranty with their LED backlight strips. You can expect the lights to run for something like 25,000 hours, which is close to three years of continuous operation. If you turn them off when you’re not watching the screen, as you should probably do, then their lifespan ought to be measured in decades. The Power Practical Luminoodle were made for people who have a modest amount of technical ability, but still want to keep things pretty simple. Their light strips are presently available in three sizes: small, large, and extra-large. For most people in most circumstances, one of these options ought to be able to get the job done. The extra-large kit runs a length of 156”, which is pretty good for illuminating the backside of an exceptionally big +60” TV. The large kit runs a length of 118”, which is pretty good for a screen that’s around 30” to 40”. 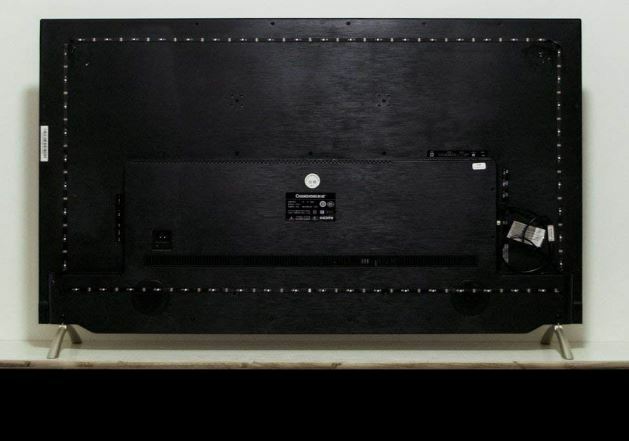 The small kit includes 39” of strip, which is okay for a smaller 24” panel, like a monitor. In addition to the various size options, each size has two versions. One version is white, and the other version is white plus color. In each case, you’ll find the whites operating between 6000K and 6500K. Quite bright, quite useful for bias lighting and creating TV accent lighting. The color version of this kit does not actually let you take advantage of the full potential of LEDs. Technically speaking, LEDs can be used to generate around 16 million shades of color. Here, you’re able to move between 15 color options. Not quite full customization, but it hits all the basics, like green, red, blue, and so forth. For someone who didn’t plan on finding some precise shade of blue, simplicity can be nice. The installation is pretty simple with the help of the included 3M adhesive, making it possible to stick these lights to the backside of your display without any issue. Though if you’re looking for a more advanced installation, you’ll need to come up with your own mounting hardware. 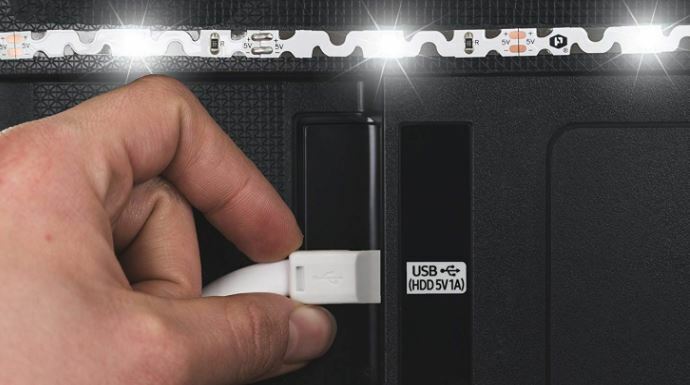 The Power Practical Luminoodle includes a one-year warranty with all of its products. LEDs like these tend to last for several years of consecutive use, so the one-year warranty is a grave underestimation of their expected lifespan. Some people are only looking for soft ambient lighting behind their screen. Other people want brighter lights. The difference is partially a matter of style, but depending on the distance between your screen and the wall behind it, brighter lights can occasionally be important to have. To put it simply, Hamlite LED TV Backlights are super-bright LEDs. They’re made to be nearly twice as bright as standard white LEDs, especially when you’re comparing them to similarly equipped lights. The heightened contrast created by having super-bright LEDs is supposed to be especially good at reducing eye strain, but whether or not that’s accurate really depends on the circumstances of your own unique installation. The Hamlite LED TV Backlight kit is also available in a wide variety of sizes. From 6.5ft of lights to 18ft of lights, you can cover screens ranging between 32” and 82”. A pretty wide variety, which should be able to support the needs of virtually anyone who’s trying to put a few ambient lights on the backside of their TV. Similar to Practical Luminoodle lights, this kit allows you to move between a highly finite number of lighting presets. In this case, you can choose between 16 different colors. There are 20 dynamic modes that allow you to make the lights flash, blink, or otherwise create some kind of ambience effect. Additionally, there are ten speeds and brightness levels to sort through. So if the brightest level happens to be too bright, it’s not tough to scale back these lights to the level you’re looking to achieve. That’s quite a bit of customization, at least, if you can look past the fact you’re limited to 16 colors instead of 16 million. The included remote is slightly more sensitive than a typical IR remote, but not by much. 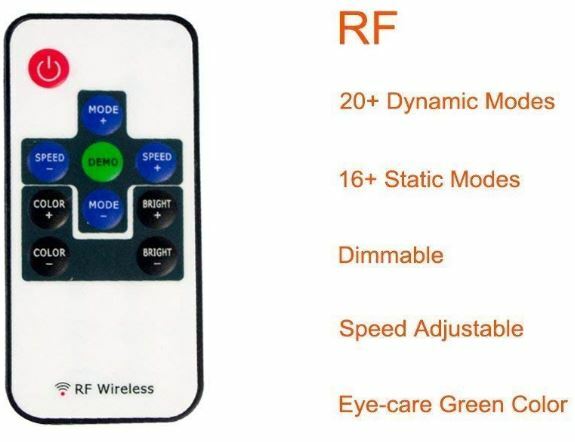 It’s a fairly intuitive RF remote, which lets you turn on or off the lights, switch between different lighting modes and speeds, and adjust the color and brightness of the lights. Basically all your controls in one place. Because it’s an analogue interface, there’s not much room for confusion. 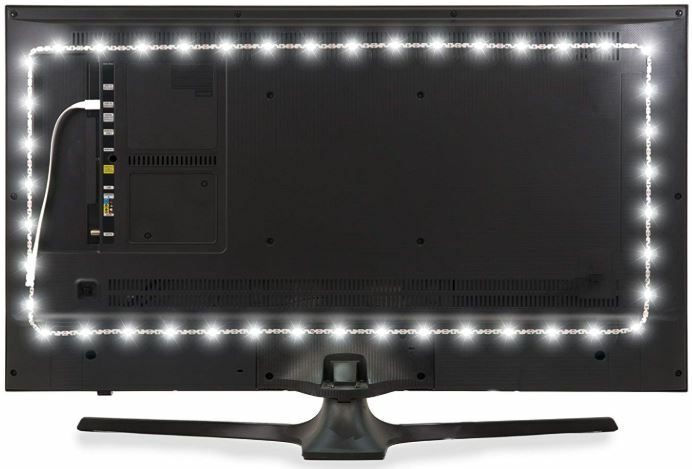 Hamlight includes a one-year warranty with their LED TV Backlight. The actual longevity of these lights will depend on how you treat them, but with care, they could easily last for decades. Govee LED Strip Lights are pretty useful for people who want color customization options. Their app support lets you take advantage of the full color potential of LEDs. Their biggest limitation is that these lights only run about 6.5ft. Being powered by USB is quite distinctive of this kit. Which really makes this the right choice for someone who either desperately wants color options, or someone who sees the convenience of running a USB connection. The Power Practical Luminoodle has a number of economical options for people who may or may not care about having color options for their LEDs. 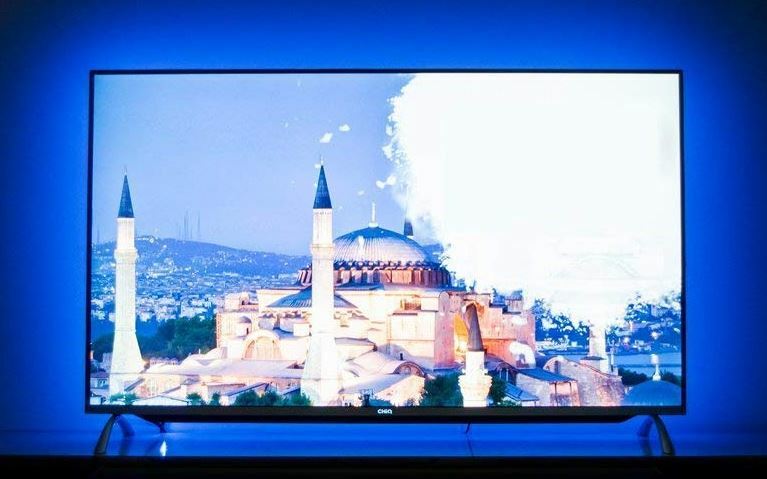 Most people setting up bias lighting for TV backlights will probably end up using white light. If you’re among that group, it makes sense to get some simple, straightforward lights that can help you save a few bucks. Which is exactly what this kit is all about. For the best size options, you’ll want to turn to Hamlite LED TV Backlight kits. Though you can’t cover smaller 24” screens, that’s pretty much the only limitation to keep in mind here. These lights can take you from 32” to 82”, they’re bright, adjustable, and easy to setup. Not exactly as cost effective as other options on this list, but LED for LED, they’re still competitively priced. then you would have two. Do any of these really change color automatically to match what is on the screen? 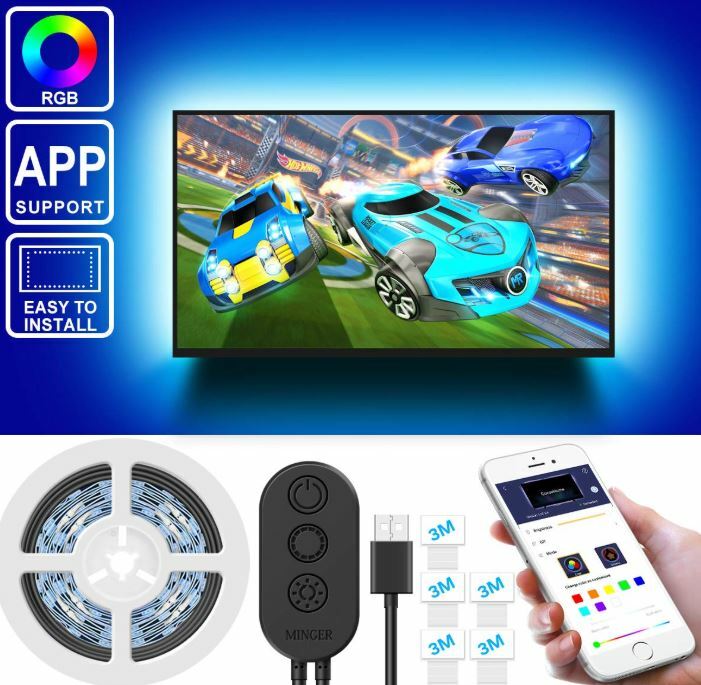 You mention that in paragraph 2, but my experience with most LED strips is that they are not “smart” but require you to set the color manually using the remote. Or is that a function of the USB controller in addition to power? My light strips have all had separate power sources. Thanks!